You know The Sunday Times? Of course you do, you’re a human bean. Well, nestled within its brunch-escorting word count this week were several utterances about everyone’s favourite minicab booking app. The article is focused on the career of ubiCabs investor and mentor, Sean Phelan, who’s been big-cheesing it around the UK tech and start-up scene since its beginning. You might consider him a sort of geo-loaction/software Ron Burgundy – he’s kind of a big deal. 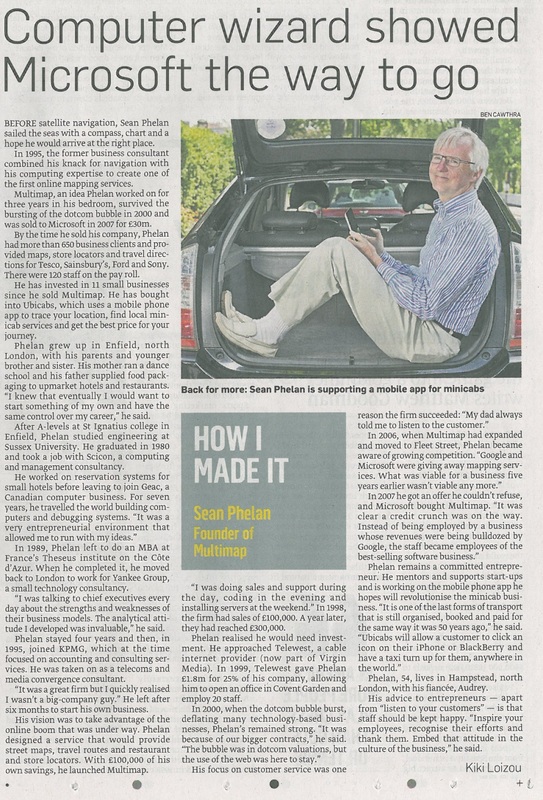 Anyway, we’re delighted to be in The Sunday Times, we’re delighted to see a photo of Sean sitting in a car boot and we’re delighted to include a picture of the coverage just down there. ‹ New Developments Changing Minicab Booking App Game, Again.